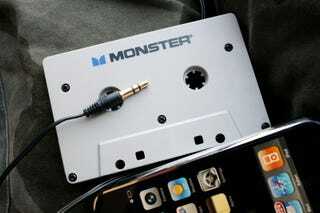 Monster's iCarPlay tape adapter is total Apple Store iPhone retail bait. Why was it irresistible on checkout? Because fat-jack aside, my old one was highly susceptible to iPhone's self-inflicted GSM buzz: the dreaded EMI that speakers exhibit when placed near cellphones. Did this fix it? Despite the Compatible with iPhone sticker, NO NO NO NO NO NO! The Bad: A simple test revealed that the Monster was no more resistant to the GSM buzz than the 10-dollar version from RadioShack. This one is $25.